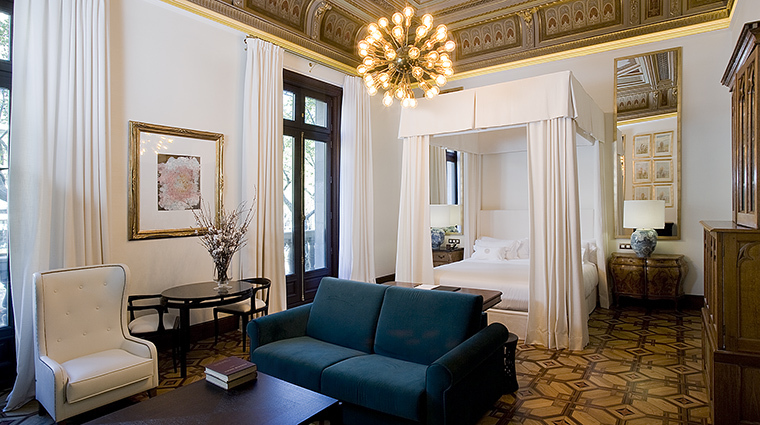 Cotton House Hotel, one of Marriott’s Autograph Collection properties, is one of the most exciting new properties in Barcelona. The hotel sits on Gran Via, one of the city’s most popular streets and close to a slew of the best attractions, from foodie favorites to shoppers’ dreams. Once the 19th-century headquarters of the Cotton Producers Guild, much of the original design was painstakingly preserved. 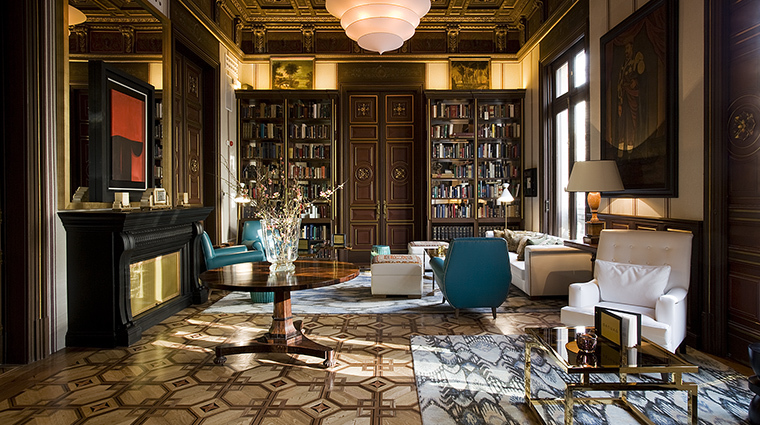 Original belle époque features like frescoed ceilings and ornate floor tiles are grand and, frankly, quite stunning, but the overall feel of the hotel isn’t stuffy at all due to interior designer Lazaro Rosa-Violan’s whimsical touches. The focal point of the landmark building is a stunning 1957 spiral staircase that is suspended via a metal frame from the ceiling. This was once a building where Catalan bourgeois would come to get their clothes tailored. Now, you can luxuriate in the modern rooms or take your pick from several stunning outdoor areas and a top-notch restaurant. 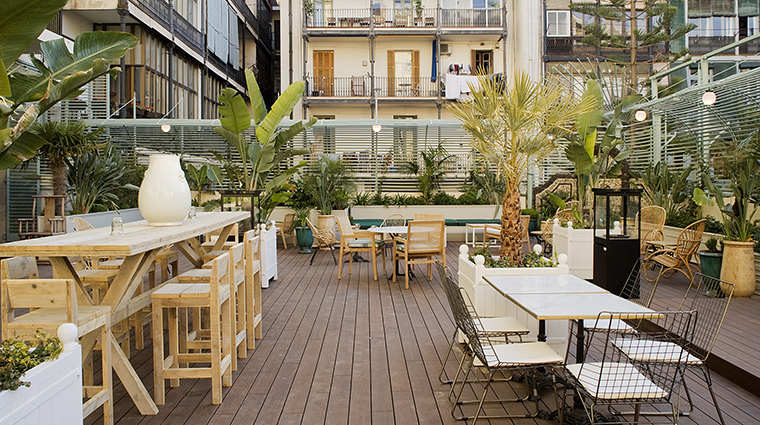 • The Barcelona hotel is conveniently located in the Eixample district and walking distance to Las Ramblas, the famed La Boqueria Market, high-end shopping and restaurants galore. • When the weather is cooperative, take a cocktail or snack by the rooftop pool or on the outdoor terrace adjacent to the restaurant. • The Mayan Spa is conveniently adjacent to Cotton House and is a unique spa experience that features traditional Mayan treatments. • The concierge team is top-notch and has been awarded the esteemed Les Clefs d’Or honor in recognition of its expertise in helping guests experience the best of Barcelona. • If custom clothing is your thing, indulge in the expert tailor service by the prestigious tailors of Santa Eulalia. The tailors will visit the luxury hotel’s atelier to take your measurements, advise and select unique fabrics for your shirt; when finished, it will be shipped to your home. • Request a “Cotton” room to take advantage of a private en suite terrace, as well as a spacious bathroom with both a bath and shower. Upper-floor Cotton rooms boast views of the sea. • Bring a bathing suit. 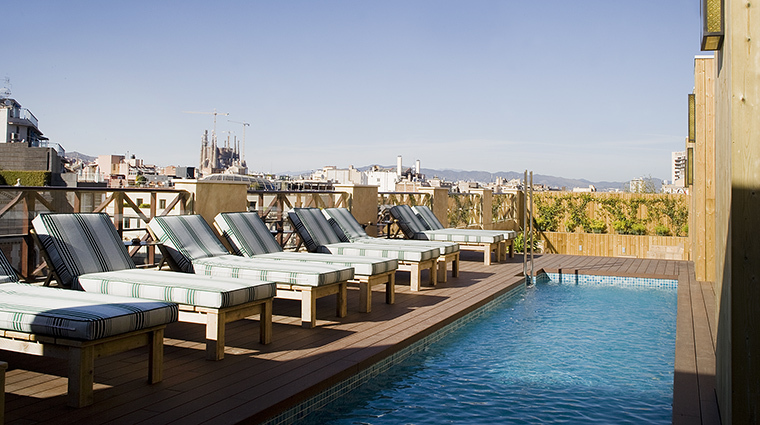 If weather permits, you can take a dip in the rooftop pool or relax on a lounger and take in impressive views of the city. • While vintage elegance is common throughout the hotel’s public spaces, the 83 rooms and suites are decidedly modern with white-on-white palettes with subtle artwork reflecting variations of the plant. • Accommodations are named after different types of cotton, from the Damask Suite to the Egyptian Cotton rooms to the Madras rooms. • Rooms are cleaned twice daily and feature impressive bath products from the Italian luxury brand Ortigia. • Most rooms are exterior facing with some including views of the sea. The signature suites come with butler service upon request. • Mediterranean cuisine is the focus at the handsome Batuar, the Cotton House’s signature restaurant and bar. The name originates with the machine that was responsible for pressing cotton to rid it of its impurities. 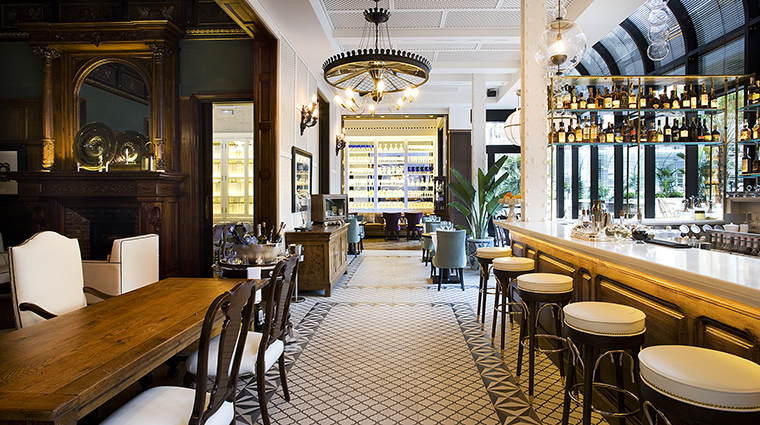 • The open and airy space is reminiscent of a French bistro or an intimate New Orleans café with its terrace providing the perfect reprieve from bustling Barcelona. Take a break with tapas such as Iberian ham, croquettes or the decadent oxtail cannelloni. • The standout drink of choice is rum. There are more than 30 different types of rum, plus top-shelf choices of gins, whiskies, tequilas and more.